As you're writing resumes and cover letters and applying for teaching jobs, keep in mind that schools and other organizations that hire teachers will expect you to have certain skills. There are many positions that call for teaching skills: college professors, private tutors, camp counselors, park rangers, and CPR instructors all teach, to list just a few examples. But when most people say “teacher,” they mean someone who teaches children in primary or secondary school. While many skills required for a teaching job depend on the school and the grade you are teaching, there are a number of skills needed for almost any teaching position. Public schools require that applicants be certified to teach. The certification process is part of a degree program at either the bachelors’ or masters’ level. Teachers must also maintain current professional development standards by taking regular refresher courses and tests.The requirements vary from position to position and from state to state. Private schools may hire non-certified teachers, but not all of them do. Some types of private school, such as Waldorf schools, require very specific training in a particular teaching method. If you are considering becoming a teacher, you have a long process ahead of you to acquire the necessary educational skills, but there are also some generalized skills that all good teachers have. Explore our list of the skills that employers often want in a teacher. You can use these skills lists throughout your job search process. Firstly, you can use these skill words in your resume. In the description of your work history, you might want to use some of the keywords. Secondly, you can use these in your cover letter. In the body of your letter, you can mention one or two of these skills, and give a specific example of a time when you demonstrated the skills at work. Finally, you can use these skill words in your interview. Make sure you have at least one example for a time you demonstrated each of the top five skills. Here is a list of the top teaching skills. Teaching, by definition, is a form of communication, so it follows that a teacher must have excellent communication skills. These include both verbal and written communication, professional yet friendly body language, and the ability to really listen. You also must be able to adapt your communication style to the needs of different students, depending on their age, culture, ability, and learning style. You will also have to communicate in clear, accurate, and professional terms with parents, colleagues, and administrators, both in person and in writing. Verbal communication skills are extremely important in teaching. You need to be able to effectively speak with your students, using a calm, clear tone. You must be able to explain the material in terms that are both accessible and meaningful to the students. Body language is also important — you want to appear confident in your stance and your facial expressions. Written communication is also important. As a teacher, you will send many emails to colleagues and will write messages to parents and students as well. You want your writing to be clear and grammatically correct. Finally, listening is an extremely important communication skill for teachers. Teachers need to listen to the concerns of students, colleagues, and parents and show that they understand what others are saying. Teachers need to be able to solve a variety of problems, often under a tight deadline. They need to answer difficult questions from students on the spot, solve conflicts between students, revise lesson plans, and deal with issues among colleagues. A good teacher knows what resources to use to solve these kinds of questions quickly and effectively. Teachers have to juggle a number of tasks, from teaching to attending meetings, to lesson planning, to grading. Getting all of it done in a timely manner requires excellent physical organization and time management. An added challenge is that teachers are usually held responsible for doing more work than can possibly fit into the hours of a traditional workday. Some work from home is a virtual necessity, but only excellent organizational skills — and excellent professional boundaries — can help a teacher determine which tasks can safely be left undone in order to free up necessary personal time. Teachers have to juggle a number of tasks, from teaching to attending meetings to lesson planning to grading. Teachers need to be able to keep all of these duties organized, and complete tasks in a timely manner. A teacher needs to be enthusiastic about whatever subject he or she is teaching. Students see that passion, and that makes them enthusiastic participants. Creativity is also a big component about being a teacher. In this role, you'll need to think of ways to convey a subject — and what works for one student (or class of kids) won't necessarily work for others. Teachers need to demonstrate patience, particularly when dealing with difficult classroom situations. They often have to explain concepts multiple times, and have to manage students who might act up or have a difficult time in class. Dealing with parents, colleagues, and administrators can also be trying. 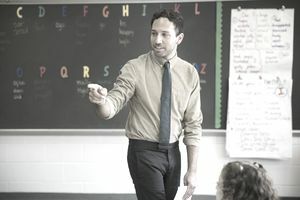 A teacher must handle all of it with a calm, professional demeanor and careful attention to the challenge of the moment. While some people are naturally more patient than others, the emotional control and maturity that go into patience can be learned and must be practiced. Teachers must, of course, understand the material that they teach. Naturally, different positions require different types and levels of skill, but even teachers of very young children need significant expertise. It is not enough for a first-grade math teacher to know how to perform basic arithmetic, for example. He or she must have a deep understanding of numbers and numeric relationships in order to be able to explain the material in a thorough and responsive way.